Can we create ways for people to learn the kinds of things that are necessary for functional adaptation without stifling their capacity to continuously create their growth? Can schools become environments that support children to perform not only as learners but as developers of their lives? This book challenges educators to look at the deeply-rooted assumptions about schooling, learning, and development and urges that the way psychology and education have constructed our conceptions of what it means to teach, to learn, and to grow may be the most serious impediment to the learning and developing of children. Beyond the criticism, the author presents an original methodological reformation of what learning and development are as relational activities and then takes readers on a visit to three radical independent school settings. Arguing that current educational models have been misguided by scientific psychology, the author states that the dominant model of human development actually hinders development. Moreover, as learning theory has become infused with developmental theory over the past 30 years, the overly cognitive manner in which psychologists have come to think about thinking, learning, and development has become further insinuated into education. Both theories--learning and developmental--fail o recognize the human capacity for relational-revolutionary activity and for performance. The prevalent mode of education--acquisitional learning--is grounded in a world view that gives primacy to knowledge and knowing which Holzman believes is inconsistent with ongoing developmental activity. The author focuses on "developmental learning"--a social constructionist, activity-theoretic conception of development which includes a transformation and synthesis of Vygotsky and philosopher Ludwig Wittgenstein. She also discusses educational projects that are self-conscious attempts to break with key elements of modern epistemology and the dominant psychological paradigm as they are perpetrated in contemporary educational theory and practice. Their specific philosophies and practices highlight important methodological issues raised in the attempt to create "postmodern schools"--schools more concerned with growing than knowing. Contents: Part I:Current Educational Models: Misguided By Scientific Psychology. Can Schools Be Growthful in a Non-Growthful World? Development and Learning: What Psychology Has Constructed. Part II:A New Cultural, Performatory Psychology. Vygotsky's Promise: The Unity Learning-Leading- Development. Performing Development: Non-Epistemological Learning. 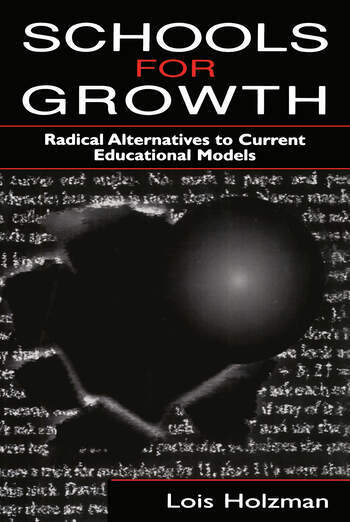 Part III:Radical Educational Alternatives and Their Developmental Potential. Project Golden Key: A Russian Experiment in Developmental Education. When Democratic Education is Developmental--The Sudbury Valley School Model. The Barbara Taylor School--A Development Community Where Children Learn. Not a Conclusion. "Holzman passionately argues that educators need to dismiss a traditional emphasis on knowledge and concentrate on 'activating the human capacity to perform--to create ourselves by being who we are not'....This text packs much information in its 150 pages, both theoretically and practically....would serve as a worthwhile course text....[recommended] to any educators interested in rethinking the role of language, communication, epistemology, and performance in their own classrooms....prods us to stretch beyond our current selves and practices." "...this volume merits inclusion for graduate students and researchers intent on understanding how learning takes place." "...the book offers a fresh and unusual perspective on Vygotsky that is likely to stimulate discussion and disagreement." "It is refreshing to read the writing of a theorist who puts her theory into practice in a very public way....the book lives up to its title in that it presents three institutions which offer an education operating within a model different from the dominant one. These case studies give hope to practitioners seeking evidence of successful alternatives to conventional school." "...advances a passionate critique of the premises on which schooling rests and presents an original alternative that is synthesized from the psychology of Vygotsky and the philosophy of Wittgenstein. The book is smoothly written and its argument is well-grounded in the current literature in the neo-Vygotskian sociohistorical school of psychology/education. The notion that education should be primarily performative is distinctive and intriguing....The book will appeal to an audience seeking radical alternatives to current models of schooling."